The more interesting part of the update however is the preview of Patch 4.0, which will be released alongside the new DLC. It turns out that what I thought was going to be a Patch 4.1 is just part of one very big patch. The highlight is the Woedica god challenge mode, which will disable health regeneration and turn all per-encounter abilities into per-rest abilities (AKA "Vancian spellcasting"), effectively restoring IE/PoE1-style strategic resource management. Josh Sawyer provides! One additional sub-class per class - That's right! 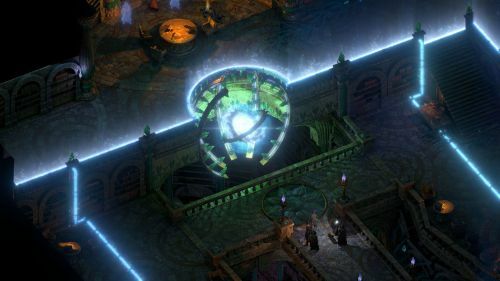 Every class in Pillars of Eternity II: Deadfire will be getting one extra sub-class, including the oft-requested Priest of Woedica and Steel Garrote sub-classes! Respawning ships on the world map - The ships of the Deadfire will no longer be gone forever once defeated. They'll now respawn, giving you the ability to attack, loot, and take down again. Storms are larger, faster, and more frequent in the Deadfire now. All numbers become ??? with the exception being item count, party character Attributes, Skill, and Level. All Per-Encounter and Class resources become Per Rest. Party Health no longer regenerates outside of combat. While camping, only "Prepared Meals" will recover Injuries and Resources. Unlike the first two DLCs, Obsidian didn't release a teaser trailer for The Forgotten Sanctum's reveal. It does have a Steam page, though. As for the patch, we'll probably learn more about it when the beta comes out in a week or two.